April 3 2019. 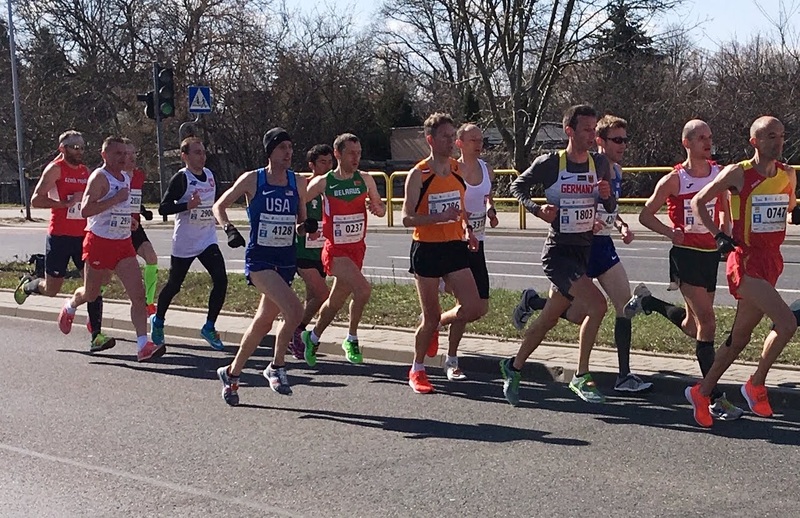 The historic city of Torun, Poland welcomed athletes from around the globe to compete in the World Masters Athletics Indoor Championships. The main focus was on the track. 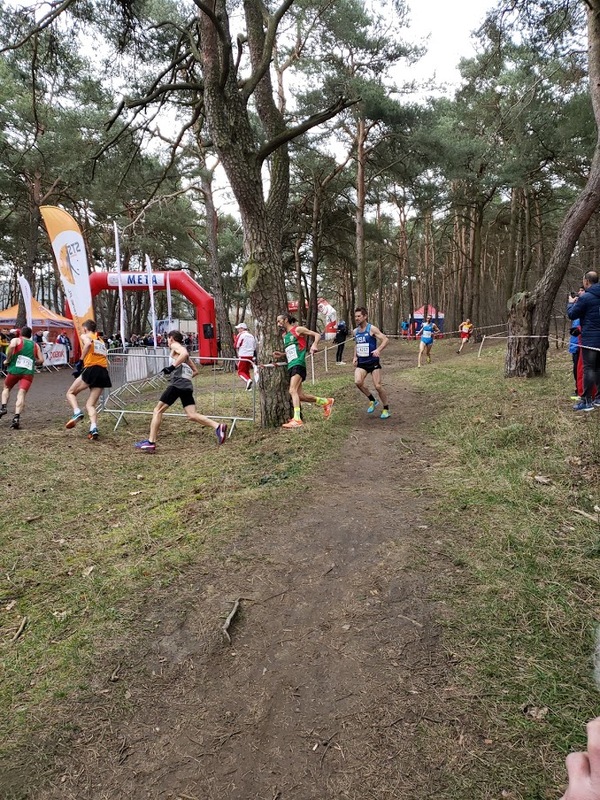 My focus is first on the Non Stadia events of Cross Country (6, 8 Km), the 10K and Half Marathon Road Races. Then I cover the Indoor Track Distances from the 800 Meters through the 3000 Meters. The Cross Country Event was held on a course at the Rudelka Park next to the Main Stadium. It was 4 laps. 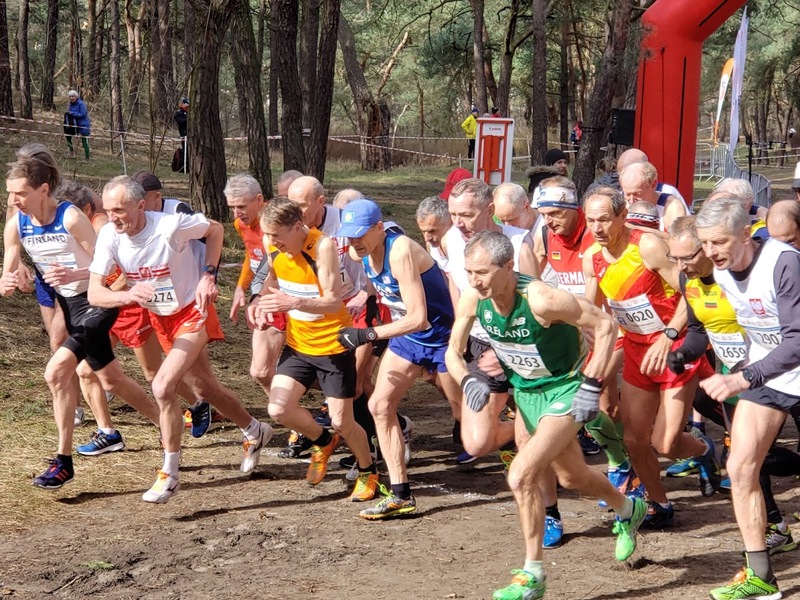 As Roger Sayre put it, "The course was very technical compared to what we do in the US, about half way between what we usually see and a trail race. So many sharp turns, some hills, and 3 or 4 sand traps per lap! Weather was good in the morning, cool and cloudy with a few sprinkles." It was a challenging course. M75 & W70 The Men 75 and up and the Women 70 and up went off at 9 am and the USA had their first Gold Medal shortly after. Heide Moebius is a celebrated runner who rarely runs in our Championships, but is typically the favorite if she does. At age 77, she took the W75 first place at our 2015 National Masters 12K Championship in 1:07:20. She was first across the line for the first Team USATF Non Stadia Gold Medal in a time of 42:25 over the 6 km course (3 laps). Her USATF Teammate, Tami Graf who just took the W80 Gold at Virginia Beach, finished 3rd, behind Pamela Jones Great Britain and Northern Ireland [Great Britain hereafter]. W70 Team Heide Moebius and Tami Graf teamed up with Kathleen Frable, who finished 11th in W70 in 49:06. They took the Bronze Medal behind Germany and Great Britain, who finished 1-2. M70 Team USATF had no entrants in the M70 XC nor the M65, the next two races. M60 The M60 race over 8 Km (4 laps) started at 10:30 and was a dynamite race between Roger Sayre, Jukka Kauppila, Finland and Thomas Payne Ireland. The three ran together for the first 2.5 laps but then the Finnish runner made a move the other two could not match and pulled away. The Irish runner plowed up the last hill, opening a small gap, but one that was large enough Sayre could not close it on the final straightaway. Sayre was 4 seconds away from Silver but a Bronze Medal in a World Championship is nothing to sneeze at. M55 No Team USATF entrants. M50 Mike McManus took 3rd in the 8K at Virginia Beach in 2017 and won the Half Marathon M50 Championship at Newport Beach that same year. He was eager to take on the World's best. Despite his best efforts this was not his day for a medal. 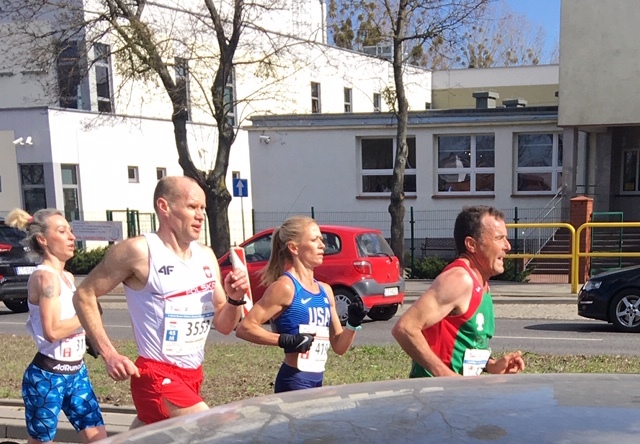 Runners from Germany, Portugal, and Ireland took 1-2-3. McManus took 6th ahead of 36 other 50-54 year old's from across the globe. It is tough to make a World podium in the last two years of your 5-year age group. 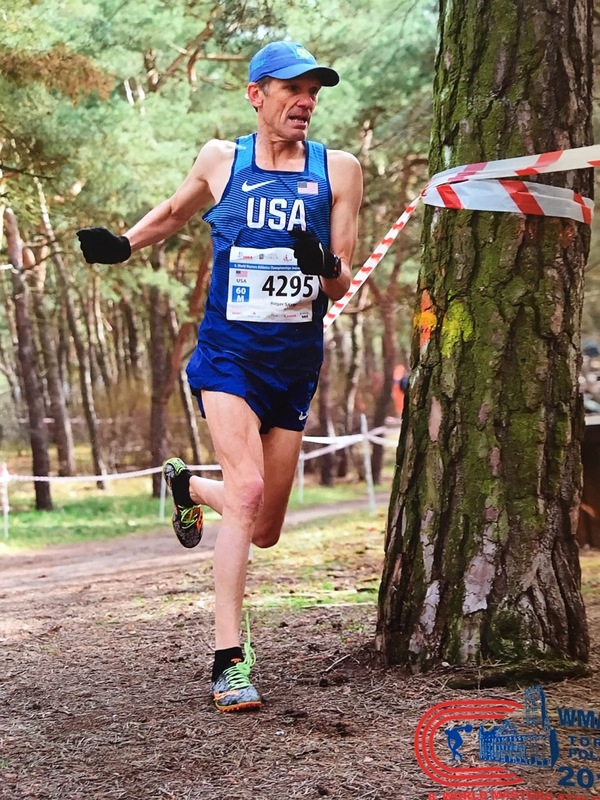 Two years from now he can go to Edmonton, Alberta, Canada to compete in the 2021 Indoor Championships XC events as a 55 year old--Watch out, World! W50 Tina Klein finished 17th. Like McManus she can compete in 55-59 at Edmonton and look for a better result. W45 Latashia Key finished 16th. The second Non-Stadia Event was the 10 Km Road Race run on and out and back course, stating and finishing at the Main Stadium.Because it was held on Day 6, March 29th, with the Half Marathon Road Race scheduled for the next day, it meant that a 10Km/HM double at top effort was out of the question for anyone who was not the dominant athlete. 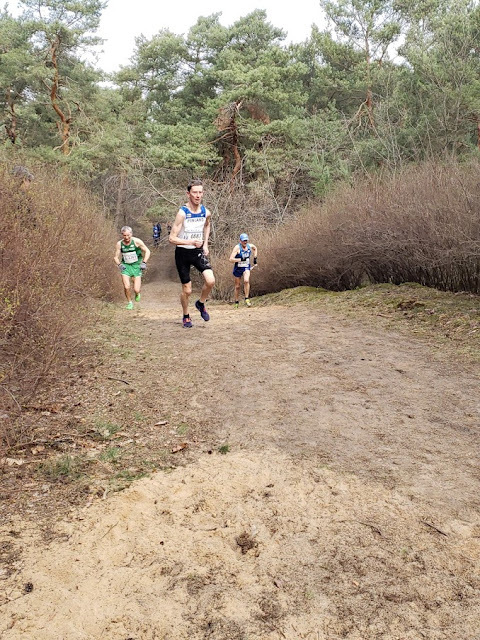 Moebius, being the dominant athlete in Women's 80-84 was able to pace herself and take the Gold in all three events, XC, 10 Km Road, and Half Marathon Road Race. W80 As noted, the remarkable Heide Moebius took her second Non-Stadia Gold Medal in the 10 Km road race with a time of 1:00:27. Despite her best efforts, Tami Graf, was not able to stay with the leaders, missing her 2nd Bronze Gold Medal as she finished just off the podium in 4th. W40 Dawn Grunnagle took the Gold Medal in 34:24, the first Woman 40 or over to cross the finish line. It was a dominant win as the second place finisher was over 3 minutes back. W65 Barbara Holzman finished 5th in 0:55. British, Irish and German athletes made up the podium. M45 When David Figueiredo of Portugal made his decisive move, Gregory Mitchell could not stay with him, but Mitchell was able to pull away from everyone else, taking the Silver Medal in 32:25, 17 seconds ahead of his nearest pursuer. M40 David Angell ran a fine race to go with his effort in the 3000 Meter race on the track but again came up just short, finishing 5th in 32:34, less than a minute off the podium. M50 Mike McManus came even closer to the podium in this road race but still ended up just outside--taking 4th place in 34:08, less than a minute away from third place. Leslie and Przemek Nowicki also competed for Team USATF, finishing 14th in W55 and 13th in M70 respectively, in their divisions in the 10K. Heide Moebius captured her third Non-Stadia Gold Medal in the Half Marathon, winning the W80 in 2:22:55. Two other runners were entered but did not start. She is the only athlete to go 3 for 3 in Gold for the Non-Stadia events. Dawn Grunnagle came the closest to matching Moebius's record, taking a Gold Medal in the W40 Half Marathon as well as the 10K. Her 1:16:25 enabled her to finish 5 minutes ahead of the field. The two Gold Medals made her trip to Poland well worth it. Roger Sayre added to the Bronze Medal he won in Cross Country. The reigning USATF Masters Half Marathon Champion, Sayre took the M60 division Gold Medal in 1:17:49. He knocked a minute and a half off of his winning time in Ann Arbor MI last June. Sayre faced a competitive field knowing it would take a strong time to win. He had just an 18 second winning margin at the finish line. Forty-two more seconds saw Kauppila, the Gold Medalist from Cross Country, cross the line for the Bronze Medal. The final Gold Medal was won by Fiona Bayly who focused her efforts on the Half Marathon. Despite spraining her ankle a week before the race, Bayly gritted her teeth and kicked home with the 4th American Gold Medal in the Half Marathon, winning her W50 division in 1:23:44. The Silver Medalist was only 5 seconds back! The final medal for Team USATF was the Team Bronze in M50+ won by Roger Sayre, Francis Burdett, and Dale Flanders. Their 3rd place time of 4:07:04 meant the runners averaged 1:22:21. 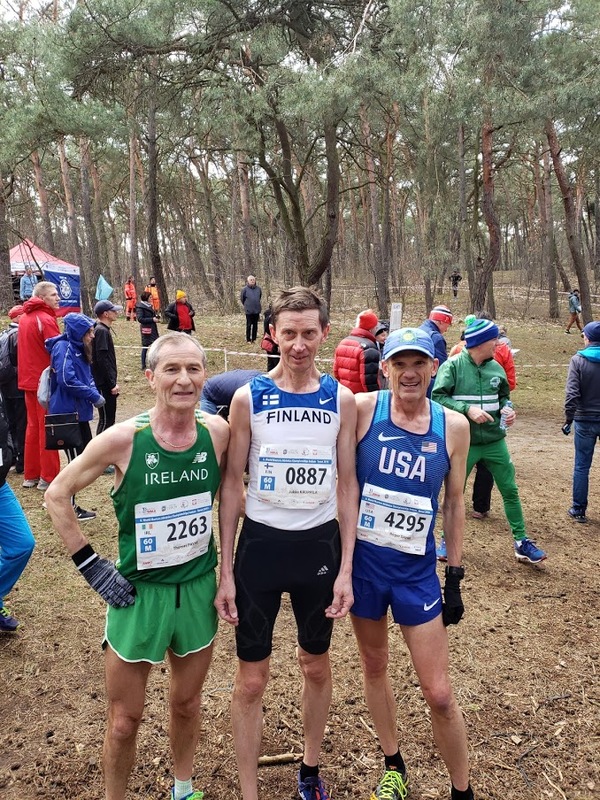 Friendly rivals inside the US, representing the Greater Springfield Harriers and the Genesee Valley Harriers, Burdett and Flanders were able to work together for much of the race, finishing just 6 seconds apart. In WMA Events, teams are only declared in advance if a ten year division has fewer than 3 runners from the country in question. 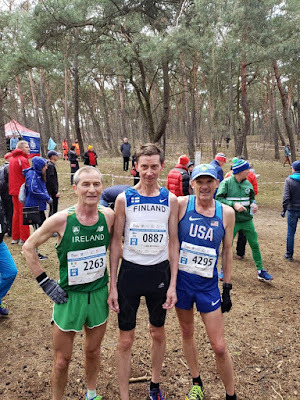 If a country has three or more runners in the M50 and M55 divisions, for example, then the Team for M50+ would be made up of the three runners with the fastest times. 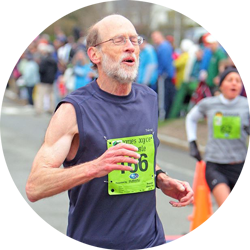 But if there are fewer than three runners in the ten year division, Team Representatives may submit a declaration that moves a runner in a higher age division down into a lower one. That is what was done for Roger Sayre. That made for a total Non-Stadia medal total of 8 Individual Gold Medals, 1 Individual Silver Medal, 2 Individual Bronze Medals, and 2 Team Bronze Medals. That was a nice improvement in individual medal count over the Non-Stadia events at the WMA Outdoor Championships in Malaga, Spain. There Team USATF earned 3 Gold, 1 Silver, and 3 Individual Bronze Medals. But there is room for much improvement in medal production. We will get three chances between now and summer 2021 to compete for Team USATF at venues closer to home. More participation of those competitive in their age division could allow us to also win more team medals. This summer sees the NCCWMA Outdoor Championships held in Toronto, Ontario, Canada. Countries from North America, Central America, and the Caribbean will send Masters teams for its regional WMA Championship. They will contest a 10K road race on Thursday the 18th and a Cross Country Event in the Non-Stadia portion of the competition. 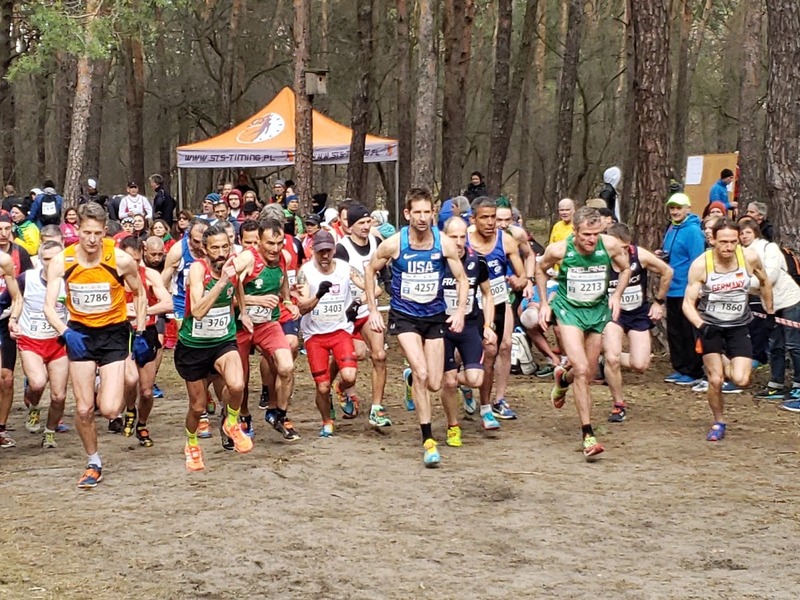 If it is organized as it was in Torun, the Cross Country will be 8 Km except for those in the 70 and above divisions, both Men and Women, who run a 6 Km course. Events on the track may also be of interest. A 1500 Meter [Sunday] and 5000 Meter event [Saturday] will be held on the track. The WMA Outdoor Championships will be held in Toronto, Ontario, Canada . These World Championships for Masters Athletes will presumably have the XC, 10 Km and HM road races as Non-Stadia events. Events on the track may also be of interest. The WMA Indoor Championships will be held in Edmonton, Alberta, Canada April 6-12, 2021. As with the Outdoor World's these Championships should have the Cross Country event, and the 10K and Half Marathon Road Races. Events on the track may also be of interest.